This flexible and easy to use portable flow meter is ideal for the support of service and maintenance activities and can also be used for the control or even the temporary replacement of permanently installed meters. Two pairs of transducers are sufficient to cover the most common pipe diameters (0,25 inch to 20 feet) and temperatures ranges (certified transducers for use in hazardous areas (ATEX and FM) are available). The FLUXUS® F601 is more than just an upgrade to its succesor, the FLUXUS® ADM 6725, an instrument which has proven itself in thousands of applications. The numerous improvements implemented, are derived from years of application practice. Its ergonomic design offers simple handling and maximum ease of use. The FLUXUS® F601 measures even longer, with even greater accuracy. The new Li-Ion battery allows for up to 14 hours of autonomous measurement. New algorithms care for the correction of pipe wall echoes and a wrong transducer positioning, thus ensuring reliable and accurate measurements - even during the most demanding application conditions. 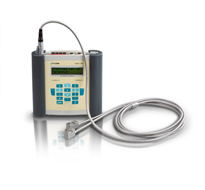 Due to the newHybridTrek mode, the flow meter can also reliably and accurately measure the flow under conditions with a gaseos or solid fraction of up to 10%. The optional thermal energy measurement capability makes the F601 an ideal companion for the analysis of the thermal energy usage (BTU) in any facility. The collected data can be used to perform a complete energy balance or to assist during process monitoring and optimization.